Papaya is an exotic tropical fruit native to Central and South America, Hawaii and Mexico. They bring an exotic touch to savory dishes and desserts. 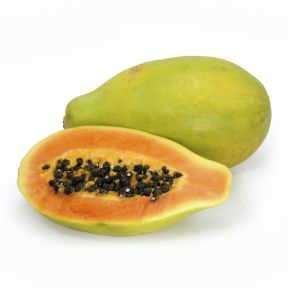 In some areas, the papaya is mistakenly referred to as pawpaw, although the true pawpaw is a completely different fruit. The flesh of the ripe papaya is bright orange-pink. It is cultivated for its melonlike orange fruits eaten raw or cooked and, more recently, for the juice which has become a commercial item. Names: Papaya, Papaw or Paw Paw (Australia), Mamao (Brazil), Tree Melon. Handling: Ripe papayas should be refrigerated to slow down the ripening process. Papayas will ripen within a few days at room temperature, and even faster if you put them in a paper bag. Once ripe, this fruit will quickly turn to mush if not properly stored. Place ripe, whole fruit in a plastic bag in the refrigerator, and it should last about a week.